The 2010 Ford Mustang will start at just $20,995, the V8-engined GT starts at $27,995 and the 540 HP 2010 Shelby GT 500 will go for $46,325. That's some seriously cheap muscle. 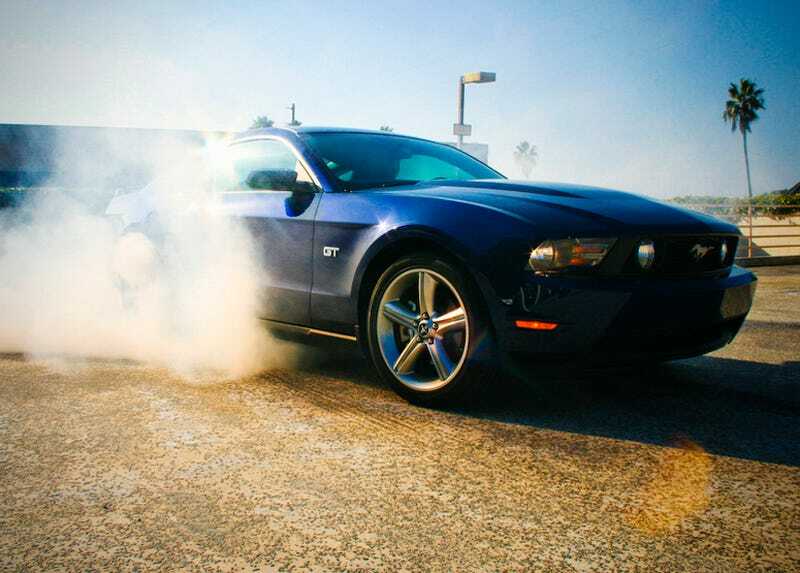 DEARBORN, Mich., Feb. 19, 2009 – The fast, fun and affordable legacy that has defined America's favorite muscle car for nearly a half century lives on in the new 2010 Ford Mustang, which incorporates an expert blend of design leadership, performance and technology at an exceptional value. "More than 9 million customers have made Mustang one of the world's most beloved automotive and cultural icons," said Ken Czubay, Ford's vice president of U.S. Sales and Marketing. "Making sure this modern legend lives up to their expectations has been our driving force to create the best Mustang ever. Not only is this the best Mustang ever, it's also the best bang for the buck for our customers." Available this spring, the new Mustang features a new exterior and interior design, upgraded materials and a long list of must-have technologies and standard safety equipment – such as Ford's AdvanceTrac® Electronic Stability Control system, all-speed traction control, anti-lock brakes and front and side air bags – for an affordable starting price of $20,995 (excluding destination and delivery) for the V-6 coupe and $25,995 for the convertible. The V-8 powered GT coupe base price is $27,995; the GT convertible starts at $32,995. The Shelby GT500 Coupe has a MSRP of $46,325, while the GT500 Convertible starts at $51,225. Contenders Chevy Camaro and Dodge Challenger sport base sticker prices ranging from $1,000 to $2,600 more than Mustang. The new exterior of the Mustang delivers more muscular, athletic styling, with new sheet metal except for the roof, including a refined powerdome hood, new front fenders, a sweeping beltline and a new decklid design. Other exterior notables include new grille and fascia differentiation between the V-6 and GT models, new front and rear fascias, higher wheel arches and new LED sequential taillights. Mustang's interior is in a class all by itself, from the new one-piece soft touch instrument panel, chrome encircled gauges and a center console design that pampers the shifter for that perfect feel and level of control. Subtle or high-profile, all interior elements are defined by precise ergonomic accuracy and a faithful devotion to craftsmanship that even the most discerning performance car enthusiast will appreciate. "Attention to detail is the bedrock of the new interior and what sets Mustang miles apart from the competition," said Mustang Design Manager Gary Morales. Mustang comes standard with Ford's AdvanceTrac® Electronic Stability Control system, which complements the car's standard all-speed traction control and anti-lock braking system. A Sport Mode, available on the GT Premium and Shelby GT500, incorporates a unique calibration of the new AdvanceTrac system, letting the driver enjoy a wider range of Mustang's performance capabilities. Mustang is America's best-selling convertible, thanks to features like a three-layer weatherproof power top. Mustang V-6 and GT models are available with convertible tops for an additional $5,000. For a no-matter-the-weather "open" experience, Mustang also offers a factory-installed glass roof option for $1,995 on the V-6 and GT models. The fixed glass roof is made of two layers of tinted privacy glass with a layer of transparent vinyl in between, which reduces vehicle cool-down time as well as infrared energy and ultraviolet (UV) rays. The roof, for example, filters 90 percent of the sun's heat-generating infrared rays and 96 percent of burn-causing UV rays. A thick polyvinyl butyral layer further filters UV rays and helps muffle wind and traffic noise by as much as five decibels. For added privacy and protection, a manually retractable mesh sun shade comes standard. Mustang also offers a wide selection of personalization options from the factory as warranty-friendly Genuine Ford Accessories, from exterior stripes to interior appearance features, wheel selections, communication and entertainment systems and more. Plus, Mustang enthusiasts can now add Performance Packs available from Ford Racing, including a Power Upgrade Pack, Handling Pack, or SuperPack – all under warranty when installed by a Ford dealer. The 2010 Mustang is jam-packed with unprecedented content, yet it weighs approximately 300 pounds less than the competing Camaro and Challenger. This leaner curb weight gives Mustang a competitive leg up in agility and contributes significantly to Mustang's unsurpassed 26 mpg. Mustang's available engines, including the GT's beefy 4.6-liter V-8, also are designed to use regular 87-octane fuel, allowing customers to save even more money at the pump, without sacrificing performance. Both Camaro and Challenger recommend premium grade gasoline. Mustang also makes fill-ups more hassle-free with its standard Easy Fuel™ Capless Fuel Fuller system, a segment exclusive. For Mustang lovers who prefer the highest performance, the 2010 Shelby GT500 offers a 5.4-liter supercharged four-valve V-8 engine that pumps out 540 horsepower and 510 ft.-lbs. of torque. Thanks in part to a cold-air intake system, lower-restriction exhaust, new engine calibration and revised gearing, the 2010 Shelby GT500 delivers more power while also increasing fuel efficiency. The GT500 improves its fuel economy by 2 mpg on the highway for a rating of 14 mpg in city driving and 22 mpg on the highway. Power is sent to the ground through a short-shift six-speed manual transmission with a limited-slip 3.55 rear axle gear ratio. New suspension tuning and aerodynamic improvements give the 2010 Shelby GT500 sharper handling, improved body control and better overall vehicle dynamics while still maintaining a good ride and handling balance. Forged and machined 19-inch alloy wheels wrapped in Goodyear F1 Supercar tires, combined with the revised suspension, gives the car a high level of grip. New standard features for the 2010 Shelby GT500 include high-end items such as Alcantara® on the heavily bolstered sport seats, steering wheel, shift boot and hand brake; leather stripes stitched into the seats that coordinate with the exterior stripe color; Q-ball shift knob and aluminum interior trim that enhances the Shelby GT500 driving environment. Both the 2010 Mustang and Shelby GT500 arrive in dealerships this spring.